Multi step word problems involving a range of operations has been our Maths focus this week in Violet 1 and 2. We were so impressed with how the children applied their numerical and inference skills to these challenging questions! We may experience a dramatic fall in the number of children in our classes, considering the convincing and persuasive application letters which were written to MI6 this week in English. 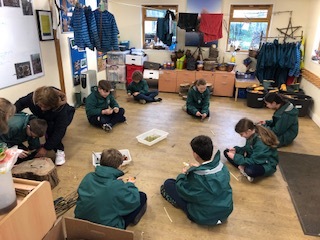 In our other subjects we recounted the story of Gethsemane, analysed topographical maps of the UK and made parachutes to test for air resistance in RE, Geography and Science respectively. What a week! We are really looking forward to our Holy Week assembly on Wednesday and the Easter bonnet parade on Thursday! A brilliant week for Violet 3! We have continued to revise and practise for our SATs and have made very pleasing progress. Keep up the hard work! In RE we have been reflecting on the importance of Lent and understanding who we are meant to be emulating during this time and why. 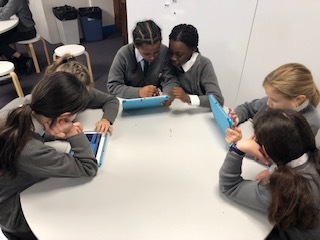 In Topic this week, we have been gathering notes on different aspects of the Mayan Civilisation in order to create a Non-Chronological Report. 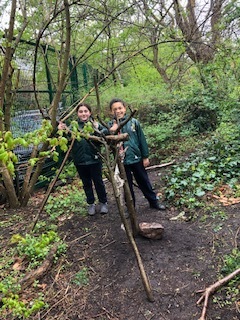 Next week, we are looking forward to our class assembly on Thursday and our trip to Paddington Rec for Forest schools. It has been a very exciting week in the Violet 1 and 2 classes! The children have written some fantastically persuasive letters about school uniform, break time, the school playground and the use of phones. They used strong, emotive language to make their points and showed confident presentation skills when reading out their letters - well done! Our maths focus this week has been on reflection, symmetry and translation of shapes. This required implementing our knowledge of co-ordinates and we were very impressed with how the children handled this tricky learning! We wrote letters from Judas' point of view in RE, conducted an exciting science experiment about water resistance and made some beautiful 'Come to Marvellous Maida Vale' posters in Topic/Art. Wow! Weeeee! Violet 3 were on fire this week! In Maths we revised challenging word problems involving fractions, percentages and decimals. Our creative juices flowed in English as we wrote descriptive pieces to create a magical atmosphere based on our class book Skellig. We built circuits in Science to test if a material was a good conductor or insulator. Can you explain the difference between the two? In RE we analysed pictures of the raising of Lazarus to help us understand the story and symbolism. Enjoy a well deserved relaxing weekend Violet 3! 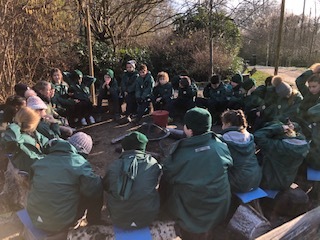 It's been a terrific week in Violet 1 and 2 which started with a thoroughly enjoyable trip to forest schools! 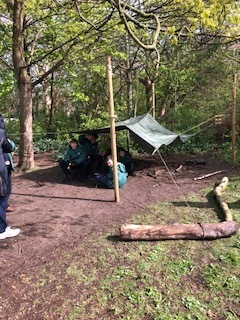 We made dens, had a camp fire with popcorn and hot chocolate and continued learning about Spring wildlife. In English we had a bumper week of learning as we covered modal verbs, sets of instructions and of course our exhilarating novel Stormbreaker. We finished off our angles learning in Maths and have had lots of fun starting studying the properties of 3D shapes. In science we looked at the work of Jane Goodall and wrote our Lent promises in RE. We are looking forward to our Lenten Mass next Tuesday at church. A busy week in Violet 3 as we continue to study and revise for our SATS. We conducted a mock SATS week and produced very pleasing results. Keep up the hard work, Violet 3!! On Tuesday, 7 children participated in a basketball competition, they worked together as a team and came fifth overall. The rest of the class went for a Lenten Mass at Our Lady's, we were very reflective and reverent. 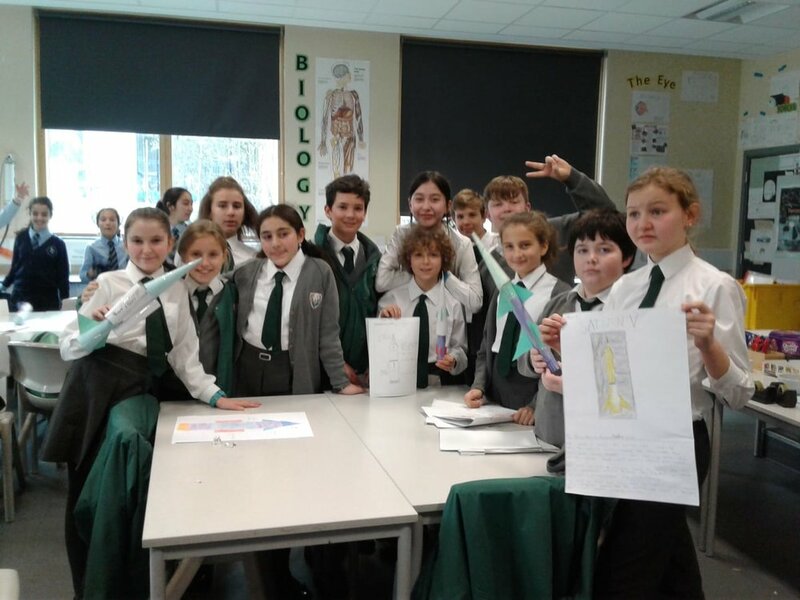 15 lucky children thoroughly enjoyed themselves at to St George's on Thursday, they got to participate in a Science workshop and returned to school with some fantastic rockets. Next week, we are looking forward to sharing our work with you at the open afternoons on Wednesday and Thursday. As a part of book week the children in Violet 1 and 2 have been writing their very own spy story books. The creativity, flair and imagination evident in both Violet classes has been utterly fantastic and we look forward to sharing our finished products on Monday. In Maths we consolidated our angles learning, in Geography we began our UK study and in RE we thought about sacrifice in connection to Lent. The children were very respectful during our Ash Wednesday Mass and conducted themselves positively and enthusiastically on our trip to the Royal Albert Hall. Both classes will be going to Forest Schools on Monday so children should wear their PE kits. A brilliant week for Violet 3. We have continued our revision for SATS in Maths this week, focusing on BIDMAS/BODMAS and solving Temperature and Negative Number word problems. 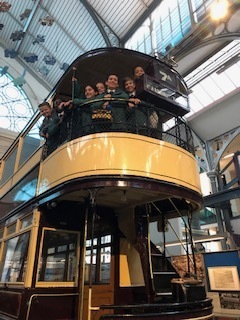 On Tuesday, we went to the Transport Museum and thoroughly enjoyed participating in the Junior Citizenship Scheme. We met Fire Fighters, Police Officers and Dog Handlers who provided us with lots of useful information about moving around London independently when we move to Secondary School. We then had lunch and a look around the museum, it was a fantastic day out! Our class assembly was on Thursday and we all gave an outstanding performance, we enjoyed sharing our knowledge of the Mayans and celebrating World Book Day. Another BIG Well Done to Odelia and Lara for writing the song for Violet 3 to perform at the end of our assembly, it was incredible! Next week, we are looking forward to the Lenten Mass on Tuesday 12th March. 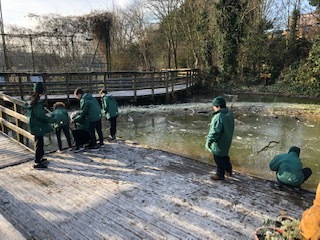 What a whirlwind week it was in Violet 1 and 2... with no less than 3 fantastic outings: a great trip to forest schools, an educational visit to the Tate Modern and of course the swimming gala where our children did us so proud! As it was art week we produced our own Picasso portraits, enjoyed our plate painting workshop as well as creating our own sketches at the Tate. We have started learning more about angle measurement in Maths and have been truly immersed in our class novel Stormbreaker this week... it's started to get really exciting! We are looking forward to our class trips to the Royal Albert Hall on Tuesday and our KS2 Ash Wednesday Mass next week. A brilliant first week back for Violet 3. We have began our revision for our SATS and this week in Maths we have been revising, addition, subtraction and challenging mixed operation multi-step word problems. In English this week we have focused on our Comprehension skills and answering questions fully. We have thoroughly enjoyed Art week! Thank you Mrs Robinson for organising plate painting and our trip to the Tate Modern. We really enjoyed drawing in the style of Roy Lichtenstein and creating our own Pop Art Drawing. 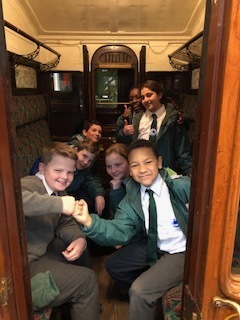 Next week, we are looking forward to our trip to the Transport Museum to take part in the Junior Citizenship Scheme. What an exciting week it was in Year 5! We had the most fantastic time on our trip to the Tower of London, where we saw the crown jewels, the ravens and, of course, the famous Beefeaters amongst other things. However, we hadn't quite rounded off our Tudor topic just yet as we had the small matter of our class assembly. Every single child performed confidently and with unwavering enthusiasm, in what was an entertaining spectacle! We remind parents that Violet 1 and 2 are going to Forest Schools on the first Monday back (25th). Have a fabulous half-term break. This week in RE Violet 1 and 2 studied a variety of paintings of the Last Supper. The children were fascinated by the different styles and techniques of Da Vinci and El Greco in particular. We all enjoyed converting metric units into imperial amounts in Maths. Our class novel Stormbreaker is getting more exciting by the minute, this week the children designed their very own spy gadgets and made incredible advertisements for these. We all enjoyed our visits to Maida Vale library and presenting our Tudor house projects to our class mates. We are really looking forward to Monday's visit to the Tower of London, remember to wrap up warm and to bring a packed lunch! An amazing week for Violet 3! In Maths we have finding the Median, Mode, Mean and Range. Can you explain how to use all four of these on the following sequence: 34, 20, 73, 68, 12. 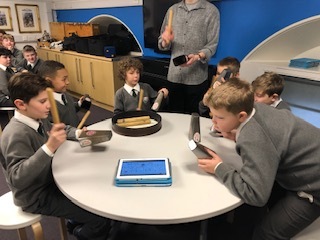 We had a brilliant time at the Music and Maths workshop on Wednesday morning at the Royal Albert Hall. 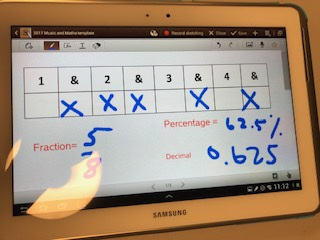 We learnt about beats in a bar and how we can convert this information between fractions, percentages and decimals. 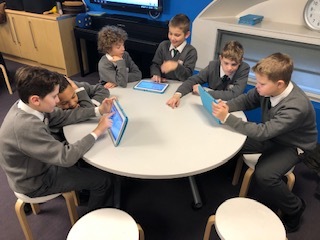 We then had a go at composing our own tunes at first using ipads and then on instruments, the trip finished with a quick look inside the spectacular Albert Hall. In RE, we explored scripture from Romans chapter 12 and we linked it to everyday life. Overall, an awesome week! Well done Violet 3! We have had a brilliant week in Violet 1 and 2. Our main Maths focus has been converting different metric units of measure, a tricky concept that the children have taken to well. In English we have looked at using descriptive language to make out writing effective. We continued reading our class novel writing some fantastic character descriptions. This week in RE the children have researched different churches within Christianity and discovered the similarities and differences between these and the Catholic church. We have continued our work on the Tudors, learning all about their buildings and houses, we can't wait to see the children's models next week! An amazing week for Violet 3. It began with a trip to the Library and we were reminded that we are never too old to have a story read to us, we thoroughly enjoyed listening to Gordon and the story he told. We worked tirelessly in Maths this week using formulas to find the Nth Term. In English, we wrote letters from the perspective of Michael, the main character from our class book Skellig, which included literary language and characterisation to hook and manipulate the reader. In Science we conducted an experiment which involved us finding our pulse and measuring our heart beat. 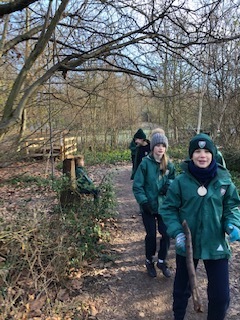 On Thursday, we had an absolutely awesome time at Forest Schools. 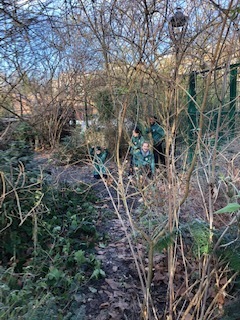 We explored the area and observed winter changes, we learnt to safely light a fire and we eat toasted marshmallows around the camp fire. It has been another busy week for Violet 1 and 2, jam-packed full of excitement! The highlight was undoubtedly Friday's visit to Westminster Cathedral. The children had researched our diocesan mother church extensively and wrote up a list of pertinent questions to ask our fantastic guides. We were all awe struck by the grandiosity of the Cathedral and the incredible views over London from the top of the bell tower. In maths we consolidated our conversions of fractions to decimals to percentages and in English we wrote theatre reviews of the production of 'A Midsummer Night's Dream' we were so fortunate to watch on Monday. The children loved learning about crime and punishment in Tudor times on Thursday and cannot wait for our visit to the Tower of London in a few weeks!